MIAMI and NEW YORK, June 14, 2017 /PRNewswire/ — More than one-third of Americans are unaware that Obamacare is another name for the Affordable Care Act, according to a poll conducted by Morning Consult earlier this year. HealthCare.com, a leading privately-owned search-and-discovery platform that helped more than 2 million consumers find health insurance in 2016, today announced the launch of The CheckUp, its new online publication. From individuals seeking coverage on their own to seniors exploring their Medicare options, The CheckUp will equip and empower Americans with the knowledge and insight to make better-informed decisions about their healthcare. The CheckUp is led by Ronald Barba, a veteran startup journalist and former Tech.Co managing editor. The site features original content and unbiased advice that helps consumers navigate the complicated American healthcare system. From tips on selecting a health insurance provider to in-depth analyses of the healthcare debates in Washington D.C., the publication intends to make healthcare easier to understand at a time when healthcare is at the forefront of the national conversation. You can visit The Checkup at healthcare.com/blog and read our Health Insurance 101 guide to brush up on the essentials you need to know about healthcare. Learn from experts at Decision Analytics and the Council of Affordable Health Coverage on things you shouldn’t overlook when choosing a healthcare plan, or read about what the doctors in Congress think about healthcare reform. HealthCare.com is a privately-owned search-and-compare health insurance shopping platform that connects consumers with its network of licensed insurance brokers and insurance carriers. The website’s origins can be traced back to 2006, but launched as a new company in 2014 as a technology- and data-driven platform to help the American consumer efficiently compare health insurance costs and subsidies. HealthCare.com currently serves the individual health insurance market (including both ACA and non-ACA plans) and the senior market with Medigap and Medicare Advantage coverage options. In 2016, the company helped more than 2 million people find healthcare coverage. HealthCare.com completed a Series A round in October of 2014, raising $9.3 from current and former executives of The Priceline Group. The company has offices in New York City, Miami, and Guatemala City. For more information, visit www.healthcare.com. 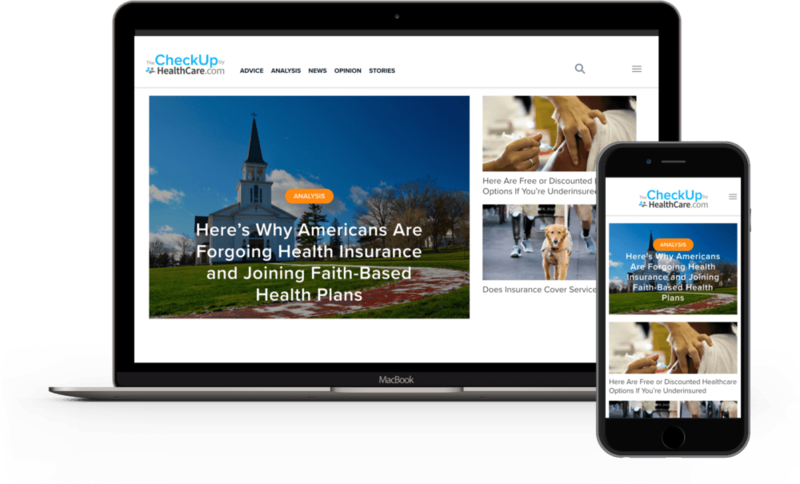 The CheckUp is an online publication that informs and educates American healthcare consumers through tips, analysis, and news on healthcare. Published by HealthCare.com, a leading privately-owned consumer healthcare shopping platform, The CheckUp features exclusive content that aims to make healthcare less confusing for American consumers and to help people make better-informed decisions regarding their healthcare coverage. For more information, visit www.healthcare.com/blog.